Disclaimer: Before we go into this topic, let me be clear that this might not be intended for regular users and could be pulled out in a future update. 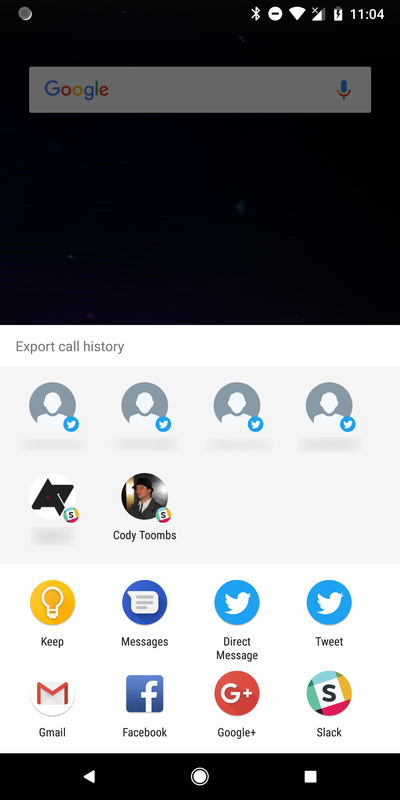 That being said, there's now a tool in Duo that can be used to instantly export your call history. There isn't any UI inside the app allowing you to launch the exporter. Rather, you just have to launch an activity manually with another app or by sending a command via ADB. For those that want to try this out, the ADB command is shown below. Left: Share dialog. Right: Google Keep note containing call history. 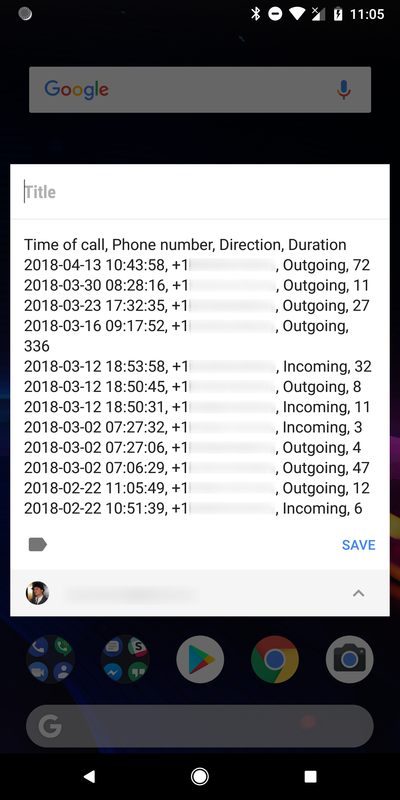 The output isn't particularly pretty, it's just a CSV (comma-separated values) list containing the time and date of each call, phone number, direction of the call (i.e. incoming or outgoing), and duration in seconds. You'll immediately get a share dialog with targets that can accept plain text. The screenshot above shows the note I get after exporting to Google Keep. There are definitely reasons regular people will want to be able to export their calling history from Duo, and it's possible Google wants to make that accessible. If this exporter is going to stick around, we'll probably see a short workflow launched from the Settings screen to explain what's going to come out of it, and there might even be some simple security steps to ensure only the phone's owner is exporting the log. On the other hand, this could just be a testing tool the developers added and never intended for regular use, so it might be gone by the next update. We've seen plenty of signs that there are experiments with the camera effects in both Allo and Duo, most recently spotted was work on a "Drishti" effect. While none have gone live yet, text for a new effect has been added, and it's probably the most likely to make the cut. We're talking about bokeh, the look of having sharp focus on the main subject of a scene while everything else is blurry. Many people might now associate this with the term "portrait mode" (or "focus selfie" on Samsung's phones) since that's the name used by many recent flagships to define the same effect. So far, the button has been added to the layout for video controls, but it's not live yet on any device I've tested. Seeing as the bokeh effect button has been given a place in the UI, it's likely this isn't just a test. There was one final addition that's a little interesting, especially for tablet users. A line was added to an internal preferences file that seems to suggest the developers are experimenting with allowing Duo to auto-rotate with a device rather than locking it to portrait orientation. There probably aren't a lot of people clamoring for free rotation on phones, but we've seen this requested in the comments by tablet users a few times, so it's not hard to imagine a few people will be eager to see this news.